Northsound 2 is to become the first commercial radio station in Scotland to make the switch to digital from analogue. 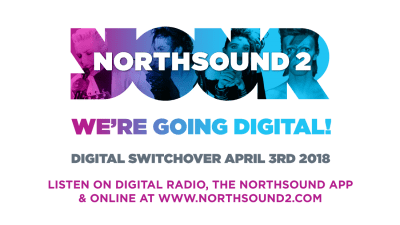 A ‘NORTHSOUND 2 – WE’RE GOING DIGITAL!’ campaign has been launched to raise awareness of the planned switchover on Tuesday, April 3, and to inform listeners how to keep listening to the North-east’s ‘Greatest Hits’ station. Although listeners will no longer be able to tune into Northsound 2 on the AM analogue frequency after the switchover, they can still listen on DAB Digital Radio, online at www.northsound2.com, via the Northsound app and via smart and voice-controlled speakers like Amazon Echo and Google Home. On Thrusday, Northsound 2 breakfast show presenter Alan Edwards and Home Run presenter Gina McKie kicked off a series of events planned for Aberdeen and Aberdeenshire, to promote the change to listeners and what they need to do ahead of the switch. Graham Bryce, Group Managing Director for Bauer City Network (England and Scotland), said the switch to digital, for Northsound 2, marks an exciting development in how we listen to radio in the North-east.